Now you see it, now you don’t! Get inspired with our State of the Art: Coverstar Automatic Safety Covers Dreambook free download and complete your dream backyard! These high-quality Coverstar automatic safety covers provide protection for your family and pets with the added benefit of effortlessly hiding your pool when its not in use. 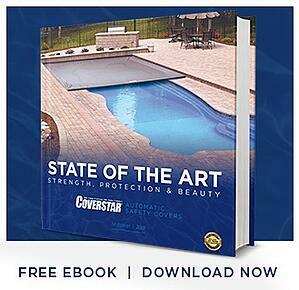 An automatic safety cover goes on and off your pool with push-button convenience, providing peace of mind. If you're having a hard time translating the picture you've imagined into real life, what better way to do it than to have some real-life examples to get you started! Don't wait - take advantage of this free Dreambook download offer now! Simply fill out and submit the form below. Your dreambook will arrive momentarily in your inbox.